Gool Peran Lowen / Happy St Piran’s Day! Hello readers! There has been a flurry of Cornish activity over the last week so this is a good opportunity to introduce a key player in contemporary Cornish identity: St Piran. 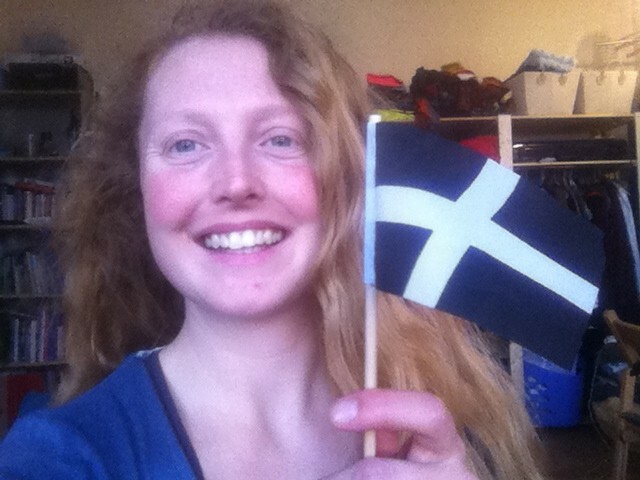 This is me with my Cornish flag my mother got me for Christmas! So, Thursday the 5th of March was St Piran’s day, and it is celebrated annually by parades, speeches, rallies and music events across the county – and across the diaspora too! St Piran is popularly regarded as the patron saint of Cornwall (although St Petroc and St Michael are also contenders for this title) and he also is the patron saint of tin-miners. Legend has it that his hearthstone was a a piece of tin ore, and the heat of the fire drew the silver metal out of the dark stone. This is represented by the white cross on the black background of the Cornish flag. The story of St Piran (or Peran in Cornish) is that he was a 6th century Irish saint who was tied to a millstone by the heathen Irish and thrown into the sea. However he didn’t sink and drown, but instead floated over on the millstone from Ireland to Cornwall where he landed on the north coast beach of Perranporth. However, the story also goes that he liked a drink and died by falling down a well. One of the oldest places of Christian worship in the UK, the oratory was covered in sand and lost for hundreds of years, eventually emerging in the 19th century. However, in the 1910 it was encased in a concrete shell to protect it. 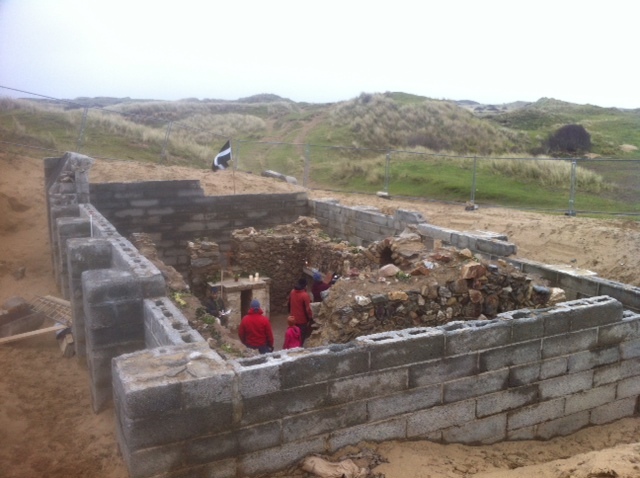 This was eventually covered in sand itself, but in 2014 work was begun by the St Piran’s Trust to re-excavate the site and put in place a long term plan for its conservation. Amazingly the oratory is still used for religious services. Over Christmas I attended a carol service in the oratory, which was a moving experience. ABOVE: The oratory before the carol service in December 2014. A march across the dunes to the oratory to celebrate St Piran’s day happens every year – and this year a special ‘Trelawney Shout’ was organised in almost 70 pubs across the county. A ‘shout’ is the term for Cornish pub singing, and ‘Trelawney’ is Cornwall’s adopted national anthem, which deserves a blog post all of its own. At 9 pm on St Piran’s day, singers across the county (and even up here in London!) all sang Trelawney together as part of their St Piran’s celebrations. More celebrations were to be had though – on Friday evening (6th or March) I and some friends went to “Kernow in the City” – an event celebrating St Piran’s day for the Cornish in London. There were pasties and ale, singing and dancing, a Cornish quiz and a good time had by all. There is already a campaign to make St Piran’s day an official public holiday in Cornwall, provoking heated debates on Cornwall’s identity and government in comments sections across the internet. Perhaps there has been some inspiration from the Welsh here – in 2000 the National Assembly for Wales voted unanimously to make St David’s day (their patron saint) a public holiday. While Cornwall doesn’t have any level of devolution or self-government as yet, this is creeping up the political agenda with the Liberal Democrat leader Nick Clegg pledging to create an elected Cornish Assembly as part of his campaign in the county. However, Mebyon Kernow, a left of centre Cornish political party, have been campaigning for more power within the county for much longer. 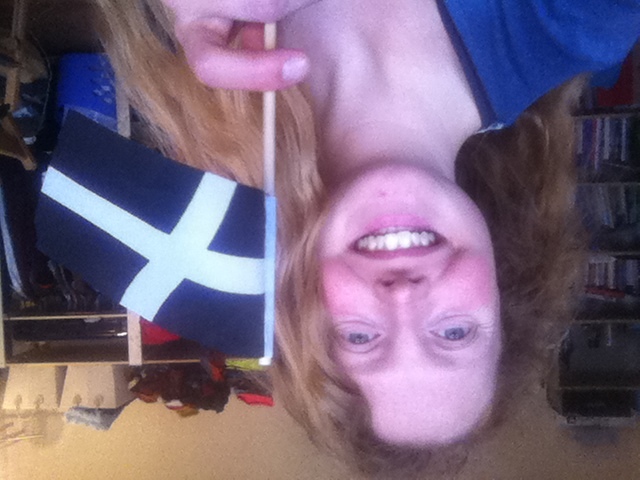 So – gool Peran lowen or happy St Piran’s day to you. Thanks for reading – comments, feedback and questions all welcome! Posted on 10th March 2015 23rd March 2015 Categories CornwallTags Cornwall, Music, Oratory, Singing, St PiranLeave a comment on Gool Peran Lowen / Happy St Piran’s Day! Hello readers! This is my first blog post and so now is the time to introduce myself and my current project. My name is Kate Neale and I grew up at Porthcothan Bay, on the north coast of Cornwall. This is a photo of me in Padstow on Mayday 2014. Padstow, just a few miles north of Porthcothan, has a very unusual and vibrant tradition known is Mayday. On the first of May (or the nearest Monday), the town is decked in greenery from the woods, ribbons, and two Osses (horses) dance around the town to the accompaniment of accordions, drums and singers. As a child my parents would bring my brother and I into Padstow to see the celebration, which we found very exciting. 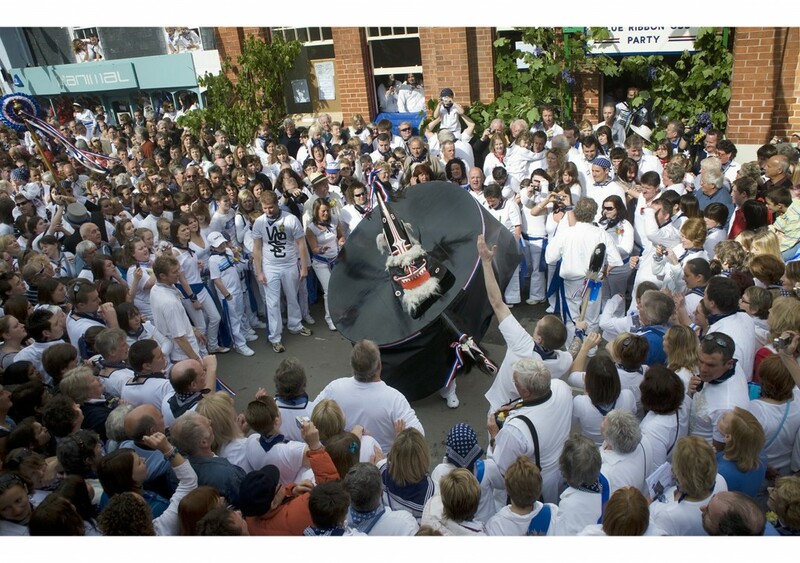 It’s hard to describe the atmosphere of Mayday – hearing the primal drum beat echoing through the streets, trying to get a glimpse of the whirling dance of the black, abstract horse, listening to the different groups sing the May song; ever since then, I’ve always tried to go to Padstow for Mayday since it continues to fascinate me. In 2007 I went to Cardiff University where I studied a BA in English and Music, and over the course of the degreee I became interested in ethnomusicology. There doesn’t appear to be a hard and fast definition of ethnomusicology, but broadly speaking it is the study of music in its cultural context; how individuals, groups, communities and societies understand and utilise music in different ways. With my mother being a music teacher, I grew up playing music and had always been intrigued by the power of music and its ability to define, direct and even create social situations. So when I realised that there was actually an academic field that fitted in with this interest, I had to go for it. I therefore focussed my final dissertation on Padstow’s Mayday, examining how the musical materials interacted with other elements of the festival to articulate identities and socio-cultural groups. At the end of my degree, I received a departmental scholarship to complete an MA in ethnomusicology. 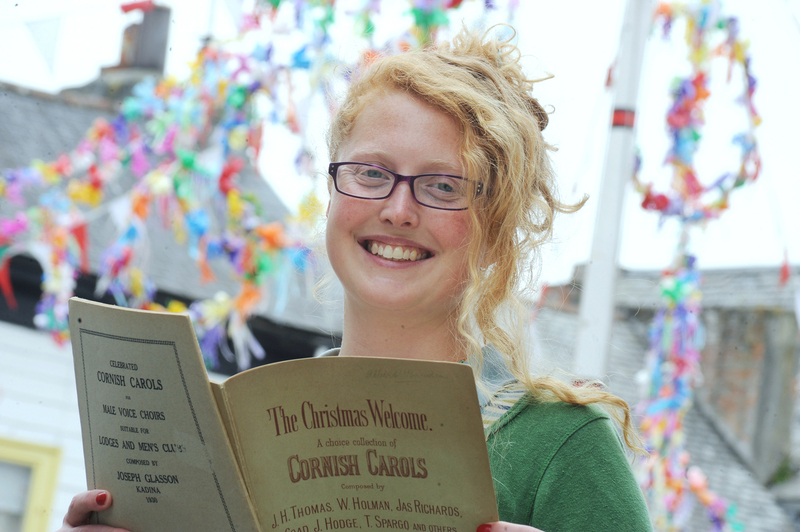 This time I focussed my thesis on the Padstow carols; another, less well known musical tradition of the town. The Padstow carollers perform a small repertoire of unusual Christmas carols in various places throughout the town every Advent Sunday. This time I was interested in how different modes of performance intersected; some carollers read from the carol book, others from memory, and some doing a bit of both. I really enjoyed this project, and it was while researching the Padstow carols that I started to find references to carols being performed all over the world in diasporic Cornish communities. And now, after three years of media work during which I continued to follow up various research threads in my spare time, and an application and interview for funding later, I’m delighted to find myself in the first year of my PhD. As it stands, my thesis is titled ‘Distant Cousins: Music, Community and Identity in the Cornish Diaspora’. My primary supervisor is Dr. John Morgan O’Connell, Director of Research at Cardiff University’s School of Music. My co-supervisor is Dr. Garry Tregidga, Director of the Institute for Cornish Studies at the University of Exeter. So – that’s a brief introduction to me and how my project started off, and I’ll tell you more in a later post. I’m hoping to add posts fairly regularly with updates on what I’m doing, so thank you for reading and if you have any questions or feedback, please leave a comment or use the form on the contact page! Posted on 9th February 2015 19th February 2015 Categories Miscellaneous2 Comments on Welcome!